This article describes the warship. For the musical piece, see Spirit of Fire (music). 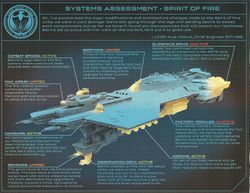 UNSC Spirit of Fire (hull classification symbol CFV-88) is a Phoenix-class support vessel in service with the UNSC Navy. Built in 2473, Spirit of Fire is a heavily modified colony ship. In 2531, her commanding officer was Captain James Cutter and her primary shipboard AI was Serina. After the crew sacrificed her slipspace drive to destroy the Forerunner shield world known as the Etran Harborage, the Spirit of Fire was forced into a slow return trip back to human space at sub-luminal velocities and was officially declared "lost with all hands" in 2534. After 28 years of drifting through space, the Spirit of Fire was mysteriously transported through slipspace to Installation 00 or the Ark, where the crew was forced into a conflict with the occupying Banished. While Serina perished during the journey as per her limited lifespan as a smart AI, the Spirit of Fire gained a new shipboard AI in Isabel, the only survivor of the Banished's attack on the UNSC outposts on the Ark. The Spirit of Fire was originally a colony ship, transporting colonists as well as equipment such as hydroponics, atmosphere generators, and prefabricated schools, in the UNSC's expansion efforts. Almost fifty years after being constructed, it was recommissioned and refitted for military service prior to the period of history known as the Human-Covenant War. The last civilian Captain of the Spirit of Fire was a man named Alexander, who had retired from active duty on July 20, 2520, after visiting the world of Verent. Directly after Alexander's retirement, the vessel was requisitioned by the UNSC and scheduled for refit in order to better prepare it for the combat operations in which it would participate. The ship was refitted with three Magnetic Accelerator Cannons and other armaments to serve as a warship. Huge storage bays that used to house machine parts now carry everything from M12 Warthogs and M808B Scorpions to construction supplies for fire bases involved in frontline engagements or in rearguard actions and repair equipment for herself and other ships and crew. In 2530 the Spirit of Fire's thrust assemblies were replaced from the destroyer UNSC Calcutta, increasing output by 37%. The Spirit of Fire being pulled into the Shield World. The Spirit of Fire took part in the Harvest Campaign as part of Battlegroup D of Admiral Cole's Third Fleet, providing ground forces with supplies, reinforcements, vehicle support, orbital MAC strikes, air support and more, giving it a major role in the battle. After the events on Harvest, the Spirit of Fire arrived at the planet Arcadia, where it assisted in the evacuation of civilians, and the eradication of the Covenant from the planet's surface. When Professor Anders was captured by the Arbiter Ripa 'Moramee, the Spirit of Fire quickly gave chase, following the Arbiter's flagship to an unknown planet in the Korinth Prior system. This planet eventually turned out to be a Forerunner Shield World, containing a fleet of Sojourner-class dreadnoughts. To ensure that the Covenant would not be able to use these warships against humanity, the reactor that powered the Spirit of Fire's Shaw-Fujikawa Translight Engine was detonated inside the Shield World's artificial sun by Sergeant John Forge. The ship managed to escape the exploding Forerunner installation, but without a functioning slipspace drive, the journey home would take many years, if not decades. Most of the crew entered cryonic sleep at this point, with only a skeleton crew remaining active to run the ship. On February 10, 2534, the Spirit of Fire, previously designated as "missing", was declared "lost with all hands" by the UNSC. The reason for this change was kept top secret. A memorial service was held for the people aboard the vessel, but many of the crew's family members chose not to attend, holding out hope that their loved ones were still alive. However, the families of the crew never truly believed the ship to be lost and continued to consider it missing until proof was found showing otherwise. The things that John Forge's father managed to learn through his military contacts suggested that the ship was declared lost simply because the brass decided that the crew's family needed closure. In hopes of leaving a trail so that they could be found, the ship made a series of preprogramed maintenance sheds and data drops during its journey which included a message recorded by John Forge for his daughter. At least one of these were eventually recovered by the UNSC. After the Human-Covenant War's conclusion, the Spirit of Fire was honored at the dedication of the living monument, along with numerous other ships that had been lost with all hands during the war. The Spirit of Fire drifting through space. Despite the measures imposed by the Chief Medical Officer O'Neil, at least one pod infector managed to infiltrate the ship at some point. Six years later in 2537, the Pod infector came into contact with one of the ship's technicians, infecting her and spreading the Flood infection to other crew members in cryo-sleep. In response, the now-rampant Serina imposed a quarantine on the ship's cryo bays in an effort to study the parasite, inadvertently allowing the Flood to mature further from within. The Flood sought to escape confinement, forcing Jerome-092 to exterminate all infected crew and with the aid of Professor Anders went on to erase all remaining traces of the Flood parasite aboard the Spirit of Fire. In the aftermath of the incident, Serina initiated her retirement from service and after composing a final status report that was to be left to Captain Cutter, finally self-terminated. Around the same time, the Spirit of Fire had reached an unknown multiple star system and was drifting near a terrestrial planet. In 2557, the salvage ship Ace of Spades, commanded by John Forge's daughter Rion Forge. undertook a salvage operation of the wreck of the UNSC Roman Blue which had been supposed to recover the Spirit of Fire's log buoy during the Battle for Arcadia. The captain's logs indicated that the CPV-class heavy destroyer Radiant Perception recovered the buoy instead. Determined to find answers, Rion was able to locate the wreck of the destroyer and retrieve the buoy through which the Ace of Spades managed to track the Spirit of Fire to the Korinth Prior system and the debris field of the Etran Harborage. There, they recovered a fragment of the shield world's AI, nicknamed by the crew as Little Bit, who was able to show them recordings of the Spirit of Fire's time at the shield world and make projections of where the vessel may have gone. However, the Ace of Spades' search was interrupted by ONI who seized Little Bit, all of their data and salvage due to a betrayal by Kip Silas. An attempt to get it back led the crew to rescuing 343 Guilty Spark, who led the Ace of Spades back to the Etran Harborage in time to witness the debris field's destruction by a massive UNSC fleet. Spark offered his aid in locating the Spirit of Fire and stated that he was better suited for the job as a fully functioning AI as opposed to Little Bit who was just a fragment. The Ace of Spades retrieved Little Bit's data and their personal belongings aided by Spark in exchange for helping him find the Librarian. Spark eventually revealed to Rion that John Forge had died destroying the Etran Harborage. During his time with the UNSC, Spark had managed to access a recovered data drop from the Spirit of Fire that included Forge's message and relayed it to Rion. Despite this news, the Ace of Spades crew decided to continue their search for the Spirit of Fire, aided by Spark and the upgrades that he had made to their ship. In March 2558 the freighter Pilgrims' Pride was carrying several AC-220 Vultures and AV-22 Sparrowhawks that were previously attached to the Spirit of Fire. The Pilgrims' Pride launched a surprise attack on the UNSC Infinity and attempted to self-destruct inside the Infinity's bay. The Spartans managed to eject the freighter out of the bay. They also saved the Pilgrims' Pride from total destruction by removing its exploding core. After recovering the remains of the attacking Vultures and Sparrowhawks, the crew used the ID numbers on the hulls to identify the ships as belonging to the Spirit of Fire. Confusing matters, the crew discovered that Pilgrims Pride had been constructed only five years earlier. While Commander Palmer speculated that the assault craft may have been stolen from the Spirit of Fire before the ship was lost, Roland pointed out that the assault craft were in fairly good condition for their age. Roland also determined that the freighter itself had been launched from Oth Lodon, a gas giant deep inside Jiralhanae-controlled space. Despite the diplomatic risks, Lord Hood, who felt guilty over his role in the Spirit of Fire's disappearance, ordered the Infinity to investigate. When they arrived at the coordinates, they found not the Spirit but Shipmaster Vata 'Gajat's ship, which was docked to a massive glassing cannon. Captain Daniel Clayton contacted the Infinity, revealing himself to be aligned with the New Colonial Alliance. Intending to exact revenge on Lord Hood, Clayton fired three massive energy beams at the Infinity. However, five Spartan-IVs managed to enter the station, stop Clayton and used the cannon to destroy 'Gajat's flagship. The Spirit of Fire arrives at the Ark. "Where you see half a crew, Isabel, I see family, courage. And a thousand heroes who swore to fight their way through hell before they'd ever... EVER turn their backs and run. And where you see one old ship, I see home. And that is always worth fighting for!" — Captain James Cutter responding to Isabel's pleas to flee from the Banished. In 2559, after 28 years of being adrift, the Spirit of Fire was mysteriously drawn through slipspace and came into orbit above Installation 00. Awakened from cryo-sleep, the crew attempted to re-establish contact with UNSC. In order to accomplish this, Spartan-II Red Team was deployed and tasked with investigating a distress signal coming from the surface. There, inside an abandoned UNSC outpost they encountered Isabel, a logistics AI, who tried to warn the Spartans. However, they were ambushed by Atriox, a Jiralhanae leader of a mercenary organization known as the Banished. He and his Brutes forced Red Team to retreat back to the Spirit of Fire. There Isabel, who became a new shipboard AI, briefed Cpt. Cutter on events that had occurred on the Ark, as well as on the strength of their enemy. Additionally, Isabel provided number of upgrades to some of ship's systems, including to its armament, subsidiary crafts and ground vehicles used by the Spirit of Fire's ground forces. In the next few days the Spirit of Fire's ground teams conducted multiple offensives against the Banished, including disrupting their salvage operations, crippling their portal network, while Spirit of Fire provided cover from orbit. As the new shipboard AI Isabel also provided battlefield support to Spirit crew during engagements with the Banished. 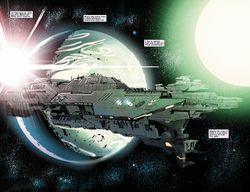 However, as the battle escalated, Atriox decided to use his flagship, the CAS-class assault carrier Enduring Conviction. An eighty-five year old Phoenix-class support vessel could not hold too long against the powerful assault carrier, so the crew proceeded with a plan developed by Isabel. Ultimately they managed to destroy the Conviction, leaving the Banished without slipspace-worthy vessels. During this time it was discovered that the Ark's Foundry had created a new replacement for Installation 04. Eventually, the Spirit of Fire crew got the upper hand and in the final battle over Halo's control room they eliminated all Banished forces on the ring. The UNSC forces managed to evacuate from Halo just before it entered slipspace for the Soell system; however, Prof. Ellen Anders became stranded inside the control room and left the Ark with the Halo, which was intercepted in slipspace by one of the Created's Guardians. On the Ark, both Cpt. Cutter and Atriox began planning their next moves against each other, not willing to leave the Ark to one another. The Spirit of Fire is a former colony ship refit for use as a military support vessel. The ship possesses dedicated factory modules located on the underside of the aft section, where robotic assembly lines can manufacture many of the UNSC vehicles and aircraft that comprise the Spirit of Fire's complement. The ship is armed with at least 40 Rampart point defense guns, 24 Archer missile pods, 10 11A2R1 naval coilgun batteries, and three Magnetic Accelerator Cannons. For faster travel between sections of the ship, at least one tram is installed. Additionally, at least 42 cryo bays are installed to enable the crew to enter cryosleep during long interstellar journeys. As a support vessel, the Spirit of Fire has a large complement of troops, subsidiary craft, vehicles, and base structures, along with the capability to construct and repair many of these. Most of the ship's embarked ground forces are Marines, with at least the 45th Marine Regiment calling the ship home. Some of the snipers serving aboard the ship are drawn from UNSC Army cavalry scouts. Thanks to the machinations of Sergeant John Forge, the Spirit of Fire maintains an unusually large complement of M850 Grizzly tanks. After the ship's arrival at the Ark, Isabel integrated the design blueprints of several modern UNSC vehicles to the Spirit of Fire's factory modules, bolstering the ship's existing complement of vehicles and craft. In addition, a number of intact D81-LRT Condor dropships were salvaged from the UNSC outposts and were mainly put to use in a similar capacity as the Spirit of Fire's extant D20 Herons. While these Condors possess slipspace drives, the Ark is far too distant from UNSC space for them to be used for a return trip. However, the crew was able to use their slipspace capabilities for long-range reconnaissance and the exploration of outlying Forerunner installations. Lieutenant Commander Alys Vallum's status report on the ship after its long journey in 2559. In addition to its pre-existing upgrades, during the ship's 28-year slower-than-light interstellar journey, Serina made a series of modifications and repairs across the ship; yet more were implemented by Isabel after her arrival on board, along with updated security and safety protocols. Following her arrival, Isabel scheduled 32,810 Critical System Updates and 1,201,924 Optional System Updates for implementation, expecting to complete them within 16 hours. At the combat bridge, Serina improved the fire control matrix and trunk lines, providing 50% additional bandwidth. The ship's sensors remained operational following its arrival at the Ark, but the Ark's sentinels would register every use of active wide-range scans as an act of aggression, limiting effective visibility to a three light-second radius. In the observation deck, previously appropriated by Professor Anders as her onboard laboratory, Serina constructed new laboratory equipment and facilities, the function of most of which remained elusive to much of the crew apart from Anders. Berthing facilities remained limited at this time, with three out of four of the atmosphere scrubbers in berthing compartments one to five inoperable. The Naval crew moved out of these facilities, only for the 45th Marine Regiment to appropriate them for their own use, maintaining even they were an improvement to their previous accommodations. The ship's factory modules remain operable by 2559, with Serina and later Isabel having made major upgrades to their usability and safety. However, these onboard factories lack both the mechanical capacity and design template to construct a new slipspace drive core. The port side of the ship, damaged in a collision with the Covenant destroyer Proclamation's Tithe, was also repaired, with all ten of the Spirit of Fire's D20 Heron dropships being operational. During the operations on Installation 00, Isabel and Anders modified the ship's Magnetic Accelerator Cannon to fire special EMP rounds capable of disabling Forerunner technology. Cpt. Cutter, Prof. Anders and Isabel on the Spirit of Fire's bridge. Bridge staff of the Spirit of Fire. Spirit of Fire crew exiting cryo-chambers. Professor Ellen Anders — Lead ONI scientist; forcibly teleported with Installation 09 to the Milky Way in 2559. Captain Cutter and Serina on the Spirit of Fire's bridge in 2531. Serina — Primary shipboard AI; Afflicted with rampancy and self-terminated - January 4, 2537. Unidentified Spartan-II — Killed during the Harvest campaign on February 4, 2531. Dimitri — Killed by a Sangheili during the Second Ark Conflict in 2559. Matthews - Killed by a Banished scout at Fort Jordan during the Second Ark Conflict. Onboard the Spirit of Fire were numerous UNSC military groups and units ranging from Fireteams to Regiments. 45th Marine Regiment — present on the Spirit of Fire circa 2559. 9th Shock Troops Battalion — present on the Spirit of Fire circa 2559. Boomerang Company — present on the Spirit of Fire circa 2559. A hallway aboard the Spirit of Fire filled with UNSC Marines and Naval personnel. Firestorm Battle Group — present on the Spirit of Fire circa 2559. Blizzard Squad — present on the Spirit of Fire circa 2559. Lotus Squad - Present on the Spirit of Fire circa 2559. Fire Team Echo — wiped out circa 2531. Fire Team India — Recon Team wiped out circa 2531. Sunray 1-1 — present on the Spirit of Fire circa 2559. Victor 397 — wiped out circa 2531. French UNSC Esprit de Feu in Halo Wars. Spirit of Fire (weapon skin) in Halo 5: Guardians. "Spirit of Fire" is a translation of one of the names of Fëanor, the arch-rival of the Dark Lord Morgoth in J. R. R. Tolkien's legendarium. Like Captain Carol Rawley's callsign, Foehammer, this is likely a deliberate Tolkien reference. Early concept art of Halo Wars suggests that a cat lived onboard the ship, possibly a pet to Captain Cutter. This is a possible reference to Jonesy, a cat that was lost aboard the UNSC Pillar of Autumn. The Spirit of Fire has its own onboard news publication, The Spirit. At some point during the development of Halo Wars the year on the ship emblem of the Spirit of fire was changed to 2418; this was a mistake and was swiftly changed back to the correct year. An early version of the Spirit of Fire's logo with the year 2418 on it. The Spirit of Fire's Ship Emblem. The Spirit of Fire transitioning through slipspace in Halo Wars: Genesis. The Shaw-Fujikawa drive room of the Spirit of Fire. Concept art of the Spirit of Fire for Halo Wars. Concept art of the Spirit of Fire's bridge. Concept art of the Spirit of Fire's observation deck turned lab. Concept art of Professor Anders' makeshift lab onboard the ship. Concept art of the ship's port side. A view of the Spirit of Fire in space. Rear view of the Spirit of Fire's engines. Professor Ellen Anders' lab on the observation deck of the Spirit of Fire. A panoramic view of the whole of the UNSC Spirit of Fire's observation deck. A holotable on the bridge. Captain Cutter, Serina, and Professor Anders on the Spirit of Fire's observation deck. The Spirit of Fire's complement of D20 Herons, with the vessel on a collision course with a Covenant destroyer. The Spirit of Fire collides with a CPV-class destroyer at the Etran Harborage. The Spirit of Fire's slipspace drive loaded aboard a transporter. Captains List on the starboard hull of the Spirit of Fire as of 2531. Spirit of Fire M12 Warthog. Spirit of Fire M12 LRV Warthog. Spirit of Fire M12G1 Warthog. A hologram of the Spirit of Fire onboard the Infinity in Halo: Escalation. A Pod infector inside the Spirit's cryo-room. The Spirit of Fire in Know Your Enemy. The Spirit of Fire arrives at Installation 00 in Halo Mythos. The bridge of the Spirit of Fire in Something has Happened. The Spirit of Fire launches a salvo of Archer missiles in support of ground forces on Installation 00. Halo Wars 2 concept art intended to reuse assets from the game's tutorial, depicting a destroyed Spirit of Fire. Warthogs and Wolverines inside the Spirit of Fire in Halo Wars 2.